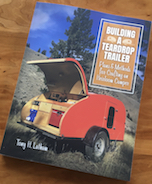 Teardrops n Tiny Travel Trailers • View topic - Is this frame a good option for a lightweight build? Again, sorry if this is dumb, just trying to make a good choice. For context I have basic welding skills and am not afraid to purchase additional tools. Thank you. Re: Is this frame a good option for a lightweight build? Looks like a torsion axle mounted in an orientation opposite of normal. As far as the frame itself, if the cabin is strong, and your overall weight low, then it should be adequate. Awesome, thank you. I'll shoot him a message and see if I can catch it for a good price. I question the axle orientation. Torsion axles need to trial not lead. Hopefully I can change the orientation then. I'm not sure how it's affixed to the frame, he's going to send me some more pictures tomorrow so hopefully I can post a couple more.